I get immediately the error. Playground execution terminated because the playground process exited unexpectedly. See image. Restart Xcode didn't helped. If the above doesn't work try removing everything in the Developer folder located at /Library/Developer/. If this still doesn't work try removing everything in ~/Library/Developer/. If this still doesn't solve it remove xcode with AppCleaner and reinstall it using the MAS version. 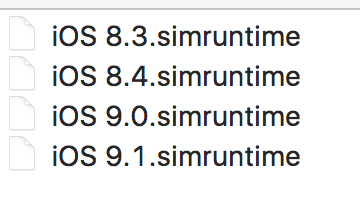 I found that doing this last thing solved the issue but it came back when I installed the simulators from xcode's download tab. Removing the .simruntime files finally solved it for me. BTW, I'm using version 7.2. A restart of the mac solves the problem. What causes the issue is still unknown. Thanks smileBot's answer. I am able to make it work with 7.2 too. I did try differently. I installed Xcode 7.2 release version via downloading. However it had problem mentioned above. I first deleted the Xcode 7.2 via AppCleaner completely. Empty the trash. Also cleaned the derived data using WatchDog for Xcode And then restart the machine. Try again, it did not work. So I went ahead deleted the folder ~/Library/Developer/ and then restart, try again, I can use Playground again in Xcode 7.2 again. Xcode 7.2 and Mac os x 10.11.2 Restart Xcode or mac does not worked for me. I solve this problem is that delete the Simulator Profiles. The Path is ~/Library/Developer/CoreSimulator/Profiles/Runtimes. Delete all Runtimes. Than Restart the Xcode, problem has been solved. then u will get an update in Appstore install that app Problem will be solved. I had gotten a reply to his from a member on the Apple Developer Forum and wanted to provide some additional information on my fix for this. First I deleted the ~/Library/Developer folder as indicated. Looking into it it had the some Simulator Profiles. I didn't know what that had to do with the Playground issue so I did NOT empty the Trash. I rebooted and the playground worked. I put back the folder and the playground had the issues again. I one by one removed the simulator profiles in the sub directory ultimately removing ALL of the profiles without deleting the ~/Library/Developer folder structure and the Playground works. With Xcode 7.2 (7C68) i had the same problem. I'd solve it by changing the entry of the runtime value from com.apple.CoreSimulator.SimRuntime.iOS-9-1 to com.apple.CoreSimulator.SimRuntime.iOS-9-2. I'd changed it in the device.plist. In ~/Library/Developer/CoreSimulator/XCPGDevices/ is one or more folder with a UUID as name. In one of this folders is the current device.plist. It's not necessary to delete manually Developer's folder. Just follow this steps in Command Line (CL). This happened to me and I found that the platform setting wasn't set for my playground. Probably because the playground was created in a previous version of XCode which didn't require it. 1.Select to show the project navigator pane. 2.Select the workspace in the navigator. 3.Select to show the Utilities pane. It is ok when Change the platform to "OS X" from inspector, but problem when back to "iOS". I don't know why...in Xcode7 Beta. Plus, it is ok in my Xcode 6.4 for both platform when playground. Not the answer you're looking for? Browse other questions tagged ios xcode swift swift-playground or ask your own question. Xcode freezes when trying to execute this in a Swift playground?